The main purpose of tantalum, as a metal powder, is to make electronic components. Usually, many enterprises recycling tantalum capacitors will sell the recovered tantalum to tantalum processing plants for reuse. Common USES include capacitors and some high power resistors. Tantalum capacitors account for more than 90% of all tantalum USES. No matter it is a large scientific computer or a small electronic instrument, tantalum capacitors can be found everywhere, which is also the most important use of tantalum. Medical titanium and titanium alloy are high quality metal materials, widely used. Titanium and titanium alloys have excellent application characteristics and are recognized as excellent metal materials in the medical field in the world. Compared with the use of stainless steel, cobalt base alloy and other metal materials, titanium and titanium alloys have greater application advantages. According to the above table, it is not difficult to see that titanium and titanium alloys have obvious advantages in specific strength, elastic modulus, corrosion resistance and corrosion fatigue resistance. Niobium is widely used in iron and steel industry, aerospace industry, superconducting materials and other fields. About 85% ~ 90% of niobium in the world is used in iron and steel production in the form of ferrocolumbium. Niobium-containing steel is widely used in automobiles, Bridges, oil pipelines, natural gas pipelines, oil drilling, offshore oil drilling platforms, railway tracks, civil and construction steel reinforcement, etc. In the pre-fabrication stage of a large number of welding joints, it is necessary to set up a special enclosed clean site and strictly control the dust pollution and air humidity in the environment. For example, clean labor protection shoes should be changed when entering the construction site to ensure the cleanliness of the welding environment. In the outdoor installation environment, make temporary operation room to achieve clean conditions. It is an important factor to ensure the welding quality to strengthen the requirements of welding joint groove, groove on both sides within 70mm and the cleanliness of welding wire surface. Vanadium has good plasticity and malleability. It can be made into sheet, drawn into wire and processed into foil at room temperature. But a small amount of impurities, especially interstitial elements (such as carbon, hydrogen, oxygen, and nitrogen) can significantly affect the physical properties of vanadium. For example, when hydrogen in vanadium is 0.01%, it will cause embrittlement and reduce plasticity. The melting point rises to 2,458 when carbon is 2.7%. K. Vanadium has high melting point, high hardness, high resistivity, weak paramagnetism, small linear expansion coefficient, and similar elastic modulus density to steel, so it can be used as structural material. Iridium - tantalum coated titanium electrode is a very good electrode material for oxygen release in acidic medium. This product is applied to organic electrolysis, such as cysteine, glyoxylic acid, succinic acid, etc. It can be used in Cr3+ electrolysis Cr6+ electrolysis of indirect oxidation in organic electrolysis. Sewage treatment is used to oxidize organic matters and toxic substances in water, such as the conversion of CN -; It can also be used as auxiliary electrode in electroplating industry, such as auxiliary anode for Cr plating, auxiliary anode for electrolytic copper, auxiliary anode for electrolytic zinc, auxiliary anode for cathodic protection, etc. Also mainly in the electrolytic electrodeposition of cobalt, nickel applications. Due to its excellent corrosion resistance, titanium is widely used as a variety of chemical reaction containers and heat exchange materials. This problem is particularly prominent when used as a structural part. 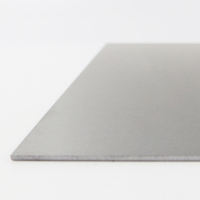 The effective solution is to use titanium steel composite plate. Titanium and ordinary steel composite known as titanium steel composite, both the corrosion resistance of titanium, and the strength of ordinary steel plate as a structure, the important is that the cost has been greatly reduced. High strength titanium alloy refers to the room temperature tensile strength between 1100 ~ 1400MPa titanium alloy, composed of nearly titanium alloy and metastable titanium alloy. The first industrial application was Ti13V11Cr3Al titanium alloy, whose tensile strength reached 1350MPa at room temperature. A corrosion resistant zirconium niobium tantalum hafnium alloy, the chemical composition includes the following weight percentage components: tantalum 0.1 ~ 10%, niobium 0.5 ~ 3%, hafnium 0.1 ~ 5%, the allowance is zirconium; The preparation method of the above corrosion resistant zirconium tantalum niobium nifnium alloy is as follows: according to the proportion of zirconium alloy materials, the crushed industrial grade zirconium, zirconium tantalum and zirconium niobium intermediate alloys are pressed into shape, and a single electrode is obtained. Among all application industries, the semiconductor industry has the most demanding requirement on the quality of target sputtering film. 12-inch silicon wafers have now been manufactured. The width of the interconnect is decreasing. Silicon wafer manufacturers require large size, high purity, low segregation, and fine grain, which requires a better microstructure. The crystal particle diameter and uniformity of the target material have been considered as the key factors affecting the film deposition rate. In addition, the purity of the film has a great relationship with the purity of the target material. Metal coating film, also known as chemical coating film, that is, before the diamond inlay, first in its surface coated with a layer of metal film, into a diamond with a metal coating. The purpose of metal coating is to improve the bonding property of diamond matrix and the temperature stability of diamond. NbCoSb was once an unidentified alloy material whose "appearance" was metallic and whose "personality" was more like a semiconductor. Because of the promise of a new generation of high-temperature thermoelectric materials, many scientists have tried to synthesize pure 1:1:1 niobium cobalt antimony, but no one has been successful. Titanium zinc composite panels is zinc alloy titanium plate do panel, 3003 h26 (H24) aluminum plate back, high pressure low density polyethylene (LDPE) as the core material, compounded by the heat of a new type of high-grade aluminum building materials, it combines the characteristics of titanium zinc plate (metal texture, surface repair function, long service life, good plasticity, etc.) and compound plate is flat and level, the advantage of high flexural performance at an organic whole, is the model of combination of classical art and modern technology. Research has found that. Tantalum is virtually imperturbable to erosion and has been used as a surgical replacement for bone (e.g. skull). Making foil or silk thread can connect broken nerves; Use of tantalum: tantalum is a light gray metal with a slightly blue color. It has a wide range of applications due to its many exotic properties. Therefore, it is known as the "kingdom of metals" generalist. Molybdenum-nickel alloys generally come in the form of rolls, strips, ingots, webbing, threads, rods, plates and foils. Ultra high purity and high purity forms also include metal powders, submicron powders and nanometer film deposition targets, chemical vapor deposition (CVD) and physical vapor deposition (PVD) applications of particles. According to the application, the target material mainly includes semiconductor target material, recording medium target material, display film target material, optical target material, superconducting target material, etc. et al. of Shanghai iron and steel research institute made a detailed classification of target materials, corresponding material types and application fields. Among them, target materials for semiconductor application, target materials for recording medium and target materials for display are three kinds of targets with the largest market scale. The material consists mainly of hafnium carbide and nitride and has a melting point of 4,400 kelvin. Before this, the most difficult material to melt in the world was tetrahydride tantalum and hafnium pentacarbide (Ta4HfC5), which has the highest melting point of any known compound at 4,200 kelvin. It can be considered by the tantalum carbide, melting point 3983 ℃) and hafnium carbide (melting point 3928 ℃) these two kinds of binary compounds. In 2015, foreign countries sold powder tantalum and hafnium, which is 99 percent pure and about 45 microns in size, for $9,540 per kilogram. Tantalum has excellent chemical properties and high corrosion resistance. They do not respond to heat, cold, or aqua regia. It can be used to make evaporator, electrode, rectifier and electrolytic capacitor. Used to make thin sheets or threads on a piece of cloth to mend damaged tissue. Its characteristic is that the cobalt niobium iron base material containing cobalt, iron, an active ingredient, the first to add a component and a second add ingredients, the active ingredient containing niobium, the first to add a composition containing tungsten, molybdenum, vanadium, zirconium, titanium, yttrium, manganese, aluminum, copper, nickel, phosphorus, gallium and germanium, tin, or their combination, and the second add composition contains calcium magnesium and carbon and boron, chromium, or their combination; Niobium with cobalt iron base material, the active ingredient, cobalt, and iron in the first add components and the second to the amount of added ingredients as a benchmark, the amount of the active ingredient in atomic percentage greater than 0 and is equal to or less than 20 atomic percentage, the amount of the active ingredient and the first to add ingredients atomic percentage greater than 0 and is equal to or less than 25 atomic percentage, and the second addition to the amount of atomic percentage greater than 0 and is equal to or less than 0.5 atomic percentage; Among them, the cobalt-fe-niobium target has niobium oxide, and the ratio of niobium oxide to the surface of cobalt-fe-niobium target is less than 35 /mm2. Density less than 4500 kg/m3, such as aluminum, magnesium, potassium, sodium, calcium, strontium, barium and so on. Niobium-titanium superconducting alloy is the most widely used superconducting material in the existing superconducting technology. The nb-ti alloy with a mass ratio of nearly l: 1 has good superconducting electrical properties and its superconducting critical transition temperature Tc=9. 5K, can operate at liquid helium temperature, it in 5T(50,000 Gs) magnetic field, the transmission current density Jc 105A/cm2(4. 2 k); The highest application field can reach 10T(100,000gs)(4. 2 k). Niobite, also known as beta stone, contains 26.6% uranium trioxide, 34.80% niobium pentoxide and 18.30% titanium dioxide. Isometric crystal system, a= 10.32a, symmetric m3m. The crystal is octahedron and diamond dodecahedron. Color brown to black, stripe brown, hardness 4 ~ 5, relative density 3.75 ~ 4.82. Produced in granite pegmatite. These include billet preparation and plasticity, welding, heat treatment and coating. Preparation of niobium - tungsten alloy ingots. Niobium - tungsten alloys are often prepared by powder metallurgy and smelting. Powder metallurgy is the preparation of ingots by mixing, pressing and sintering niobium, tungsten and other elemental powders into prealloyed strips, followed by more than two vacuum electron beam smelting or vacuum arc smelting or the combination of the two smelting methods. At present, there are two kinds of platinum crucible processing in China: 1. Die stamping; 2. Spinning forming. Disadvantages: platinum-sheet drawing is made by stamping the bottom of the die. As it is stressed locally, the wall thickness of the stressed part is thinner than that of other parts, and the overall thickness of the crucible is uneven, which ultimately affects the service life of the platinum crucible. Titanium alloy has high strength and small density, good mechanical properties, toughness and corrosion resistance. In addition, the process performance of titanium alloy is poor, cutting difficult, in hot processing, very easy to absorb impurities such as hydrogen, oxygen, nitrogen and carbon. There is poor wear resistance, the production process is complex. Industrial production of titanium began in 1948. The development of the aviation industry requires the titanium industry to grow at an average annual growth rate of about 8%. At present, the world's annual output of titanium alloy processing materials has reached more than 40,000 tons, nearly 30 kinds of titanium alloy brand. The most widely used titanium alloys are ti-6al-4v (TC4), ti-5al-2.5 Sn(TA7) and industrial pure titanium (TA1, TA2 and TA3). The technology of making high purity tantalum ingots from waste tantalum blocks invented by the team has won the national patent. The technology turns waste into treasure, which not only realizes the recycling of special metal resources, but also greatly reduces the production cost of the enterprise, and realizes the "win-win" of environmental protection and industrial benefits. It is reported that the company's technology innovation team currently has more than 20 core members, master's degree or above accounted for 25%. "Whether it is technical backbone, or production backbone, as long as you can make achievements will be rewarded, house, car award, the company's staff innovation enthusiasm is very high. Pure tantalum has good plasticity, small deformation resistance and low processing hardening rate. All kinds of profiles and shaped parts can be produced by plastic processing method. Pure tantalum can be rolled into sheets, sheets, sheets, sheets, pipes, and bars at room temperature. To reduce oxidation, pure tantalum plastic processing at room temperature or below 500 ℃. Tantalum alloy with high strength and ingot casting low plasticity, must be sufficiently above 1200 ℃, the processing technology of the same as the pure tantalum. The extrusion ratio should be greater than 4 and the forging ratio should be greater than 2. When the billet is heated, the plasticity of the material should be decreased due to gas pollution. Cross rolling is used to ensure good stamping and spinning properties. The rate of cross - rolling should be maintained at about 80%. Tantalum plate can be made into cup, cap, pipe, cone, nozzle and other parts of different shapes by spinning and deep-drawing. The diameter of the rotary forging rod for drawing is generally 2.5mm. Because tantalum is soft, it is easy to bond and scratch the surface of the die, the surface of the wire is often anodized to form an oxide film and lubricated with beeswax before drawing. Tantalum (intan: the name of the king of wealth, derived from Greek mythology, discovered in 1900.) Tantalum is virtually impervious to erosion.In surgery, there is a great contribution to the repair of the human body: it can replace bones (such as the head). Sodium niobate, potassium hafnium zirconium titanate and calcium titanate are lead-free piezoelectric ceramics, which involve a new type of multielement lead-free piezoelectric ceramic composition and belong to the field of perovskite structure piezoelectric ceramics. The composition provided by the invention can be expressed by general formula (1-w)(k1-xnax) nbo3-wca (ti1-y-zzryhfz)O3, in which 0 < x < 1, 0 < y < 1, 0 < z < 1, 0 < w < 0.10. The lead-free piezoelectric ceramic composition may also contain one or more oxides, the general formula of which is (1-w)(k1-xnax) nbo3-wca (ti1-y-zzryhfz)O3+aM O (mol %), M O is one or more doped oxides, the molar ratio of a to the main component (1-w)(k1-xnax) nbo3-wca (ti1-y-zzryhfz)O3 is 0-3%, M is + 1-6 valence and can form solid oxides with oxygen. The optimal value of the piezoelectric constant d33 of the system's piezoelectric ceramic composition can reach more than 190pC/N, and the electromechanical coupling coefficients KP and kt can reach more than 45%. The process is stable, and it is made from traditional piezoelectric ceramic preparation technology and industrial raw materials, which is practical.